Do you have an account with Indian Bank? Indian Bank is one of the largest banks in the Public Banking Sector of India. It has numbers of branches in different cities across all states of India. The bank gives high effort to deliver excellent banking services to its customers. Introduction of missed call services and SMS services has added benefits and convenience for the customers. With the advanced and latest banking services, you can obtain your Indian Bank account balance and mini-statement in real time without visiting the branch or ATM or access internet banking service. Open the default message and select write/create a message. 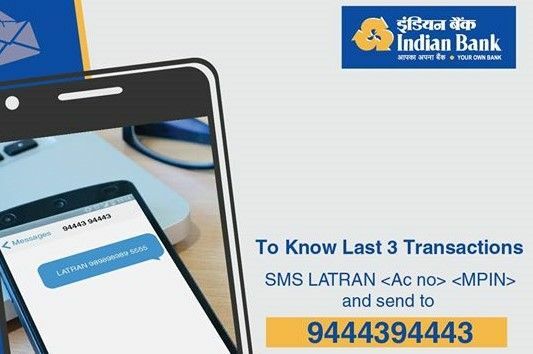 Type 'LATRAN Account Number M-PIN' and send it to 9444394443. You will receive an SMS within a few minutes containing the details of the last three transactions made in your account. Important Note: Indian Bank delivers an M-Pin to every customer for accessing Mobile-banking services. You can activate mobile banking by visiting your home branch. You need not pay any charges either to the bank or to the network service provider as both the dedicated numbers for missed call services and SMS services are toll-free. You can access the services anytime and from anywhere. But, make sure to dial or send the SMS from your registered mobile number linked with the bank account. The smart banking services replaced the traditional options of obtaining the Mini-Statement offering instant services. Visit the branch and get your mobile number registered before you access the services. Remain updated with the available balance and the last transactions made in your account with the latest banking services. How to get indian bank mini statement by SMS.